These managers can offer suggestions and mediate discussions to help you avoid potential injuries and costly delays. If it has been a while since your crews and other employees have had a safety presentation, toolbox talk or construction site meeting, consider scheduling one prior to an upcoming job to assist with planning and conducting your work. This is an excellent opportunity to learn about the best practices in the industry. 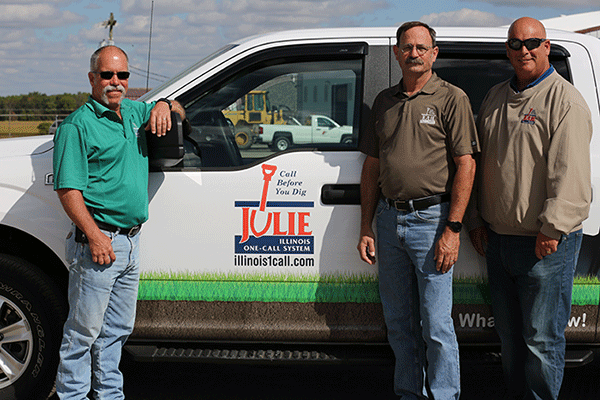 In addition to conducting safety meetings throughout the state, Dave, Brian and Roger represent our not-for-profit organization at special events, conferences, conventions, trade shows and open houses to promote the use of JULIE and help reduce damages to underground utility facilities. There is no cost for a safety presentation. For more information or to schedule a presentation, please contact a JULIE Damage Prevention Manager in your area during normal business hours.